tition on the Romanian data. Thus ... Word Sense Disambiguation, Romanian, memory-based learn- ing ... POS tags, the closest verbs, nouns, and prepositions. Lambon Ralph, Sage, and Ellis (1996) described a patient, JO, who had ... tient with word meaning deafness whose com- ..... Tyler, L.K., & Moss, H.E. (1997). Andrew W. Ellis ... Lambon Ralph, Sage, and Ellis (1996) described a patient, JO, who had impaired ..... Hodg es, J.R., Patterson, K., Oxbury, S., & Funnell, E.
Each special issue will be devoted to a single theme and edited by a guest editor or ... select papers submitted in response to an announcement in the journal. http://www.biolinguistics.eu. Linguistic Universals as Human Universals â. Divergent Views and Converging Evidence on. Language Congruence and Diversity. 0. INTRODUCTION (1) It has been known for at least one century that certain word order combinations tend to cooccur, but it is only since a few decades that serious attempts have been made to account for these ordering cooccurrences (2). This is probably due to the fact that it was not until the nineteen sixties that word order patterns were investigated systematically in a considerable number of languages, when Joseph Greenberg published an essay that was to become quite famous, entitled Some universals of grammar with particular reference to the order of meaningful elements (Greenberg 1966). On the basis of observations in 30 randomly selected languages he proposed 45 universals of language, about half of which related to syntax. For example : UNIVERSAL 1. In declarative sentences with nominal subject and object, the dominant order is almost always one in which the subject precedes the object. UNIVERSAL 2. In languages with prepositions the genitive almost always follows the governing noun, while in languages with postpositions it almost always precedes. UNIVERSAL 3. Languages prepositional. UNIVERSAL 4. With overwhelmingly greater than chance languages with normal SOV order are postpositional. UNIVERSAL 16. In languages with dominant order VSO, an inflected auxiliary always precedes the main verb. In languages with dominant order SOV, an inflected auxiliary always follows the main verb. Additionally he presented a classification of 142 languages, employing four parameters: 1. the position of the verb relative to nominal subject and object (i.e. VSO-SVO-SOV); 2. the position of the adposition (i.e. preposition-postposition); 3. the position of the adjective (A); 4. the position of the genitive (G) relative to the noun (N). I.e. VSO/SVO/SOV & pr/po & NA/AN & NG/GN. Thus 24 classes could be set up, 8 for each major language type...Recently Hawkins (1983), using the same parameters, has been able to expand this sample to over 300 languages; his sample is given in table 1. V-l stands for V-initial so as to capture some languages that are supposed to have dominant VOS order; the dashes indicate the position of the adjective and the genitive/possessor noun. Table 1 . Classification of languages; adapted from Hawkins (1983). 1. THE ORDER OF CONSTITUENTS IN FUNCTIONAL GRAMMAR Any theory about natural language will have to account for these harmonic relations and in Functional Grammar (henceforth FG; Dik 1978, 1983) these and other universal ordering tendencies are captured by general PRINCIPLES OF CONSTITUENT ORDE­ RING. In the functional framework the actual order of constituents in a linguistic expression is determined by PLACEMENT RULES, which are applied to fully specified, but unordered underlying predications. These Placement Rules are guided by general Principles of Constituent Ordering (see section 4). The significance of each of these (interacting) principles may vary from language to language, and while some are "harmonic", others define more or less conflicting ordering preferences. As Dik (in preparation) puts it:"Hardly any of these principles has absolute 100 % validity; most of them can be counteracted by one or more of the other principles. They are like forces pulling in different directions, with varying outcomes in different languages". In Dik (1983) twelve such ordering principles are proposed, some of which find their origin in Greenberg's 1966 essay. Here Greenberg's observations will be interpreted in terms of the PRINCIPLE OF HEAD PROXIMITY (PHP). We will try to show that this proposed universal ordering principle not only accounts for the harmonic relations, but also that it may relate to linguistic phenomena that have so far been treated separately, such as the number of terms in a predication, serialization, extraposition, and discontinuous verb complexes in SOV languages. Finally it will be suggested that PHP could lead to a reduction of the number of FG Principles of Constituent Ordering. Attributive Material or simply AM (cf. table 2). Predicate operators (auxiliary verbs and the like), Terms. Term operators (determiner, quantifier) modifiers (adjective, genitive, etc.). As to V-final languages that allow certain constituents to appear postverbally, see section 2.2. There is a universally relevant clause-initial position PI, which is used for special purposes, including the placement of constituents with Topic or Focus function. Since the Subject is the prime Topic candidate, it will often end up in PI; this may lead to reinterpretation of PI as the unmarked Subject Position. The position of the auxiliary remains problematic in terms of head proximity, of course; we will assume that FG principles III and IV override PHP in languages of the type with which we are concern­ ed here. a language with dominant SOV order, there is order, or only OSV as the alternative, then all of the verb likewise precede the verb (This is m). particles (8). Steele et al. (1981: 21) attempt to characterize the category Aux for all languages ; their definition reads as follows : Given a set of language internal analyses, those constituents which may contain only a specified (i.e. fixed and small) set of elements, crucially containing elements marking tefise and/ or modality, will be identified as nondistinct. This definition includes both verbal and non-verbal auxiliaries. In an earlier study Steele (1978: 35) had also observed that "languages with a second position AUX are predominantly either rigid SVO languages [...] or SOV languages with relatively free word order (Luiseno, Walbiri, Karok)". As far as the evidence goes we are now able to impose a restriction on the distribution of auxiliaries in clause-second position in V-final languages to the effect that an auxiliary will only occur after the PI constituent in languages of the non-rigid V-final subtype, as was predicted on the basis of PHP. 3. SUPPORTING EVIDENCE In the previous sections it was suggested that the four largest groups, which together contain 247 languages or about 75% of Hawkins's sample, display ordering patterns that are generally compatible with the idea that head nouns prefer to be contiguous to the verb. The Principle of Head Proximity, however, states that basically this preference is shared by ALL head nouns, whereas only one or maximally two head nouns can actually occur next to some verb in the linear organization of the clause (9). So strictly speaking every head noun that is not adjacent to a verb is at variance with PHP. Therefore we may expect languages to display "remedial" structures that can be interpreted as supporting evi­ dence for the universal ordering principle that is proposed here. From a logical point of view there are three ways in which languages can deal with non-contiguity between Heads V and N, namely by : 1. restricting the number of noun phrases per clause; 2. employing more verbs in one clause; 3. extraposing elements that would normally occur between Heads. These "strategies" are discussed in the following sections. Some psycholinguistic evidence for PHP will be offered as well. Clitic Type languages may eventually turn into languages of the Appositional Type (see above) and the whole process may start again. Although this summary does not do justice to De Groot and Limburg's theory in that we have only sketched the general idea (which they apply to other phenomena as well), it adequately illustrates the statement made above, i.e. that there might be a universal tendency to restrict the number of overtly expressed noun phrases per clause. Of course this tendency can only go as far as the rules for successful communication allow it to go and it should be noted that as a rule only arguments, i.e. constituents that are required by the verb, are signalled by bound morphology on the verb (10). There are, however, also ways to reduce the number of satel­ lites, i.e. constituents that are not required by the verb. In a number of Papuan languages this is attained by the employment of extra clauses, as for instance in Kobon and Usan. KOBON (Davies 1981: 45-46) : All of the obligatory and optional arguments [i.e. arguments and satellites - JR] can cooccur but if many arguments are involved there is a strong preference for dividing them over two or more clauses which may contain an identical predicate rather than including them all in one clause. It must be noted, though, that there is no consensus as to the categorial status of these verb-like elements; i.e. opinions differ whether they are to be regarded as verbs or as relators (adpositions). For instance Givon (1984: 179-180; examples (18a-g) are his) suggests that verbs in a serial construction (with the exception of the first verb in the series) serve as case-role markers of adjacent nouns. Nevertheless, we will assume here that they provide sup­ porting evidence for the Principle of Head Proximity. 3.3. THE POSITION OF AM OF THE HEAD NOUN Let us first have a look at structures as they could occur in languages of the three major groups. Now suppose that in each of these structures none of the NPs can be omitted without a serious loss of information. In that case at least two head nouns in the V-second type and at least three in the other language types are separated from the verb. Their contiguity to the verb is obstructed by one or more other head nouns that may be accompanied by some AM as well. In this situation there is still a way in which non-contiguous head nouns can appear at a relatively closer distance from the verb, i.e. attain better head proximity : this can be done by allowing the AM of an obstructing noun to appear in a position where it will not stand between the noun and the verb. Indeed in many languages we find instances of AM occurring outside its proper domain (a phenomenon usually known as extraposition), although not just any type of AM is liable to displace­ ment. This might be related to the Bondedness Hierarchy proposed by Foley, who argues that "the bond between an article and its head noun is much stronger than that between a relative clause and its head noun" (1976 : 20; see figure). universal word order tendencies would reflect two essential fea­ tures of this type of organisation : 1) Heads of domains take up prominent positions in a predication, key-positions one might say ; 2) no AM occurs between these Heads. Interestingly some evidence for this hypothetical view might be provided by language percep­ tion research. For example, Moore (1972) designed a test in which students had to rate sentences in terms of grammaticality under time pressure. His results suggest that the relations between the verb and the arguments are processed before the relations internal to each argument. Thus we might posit that when they process a linguistic utterance, listeners first attempt to identify relations between the head nouns and the verb. This would imply that Heads are the most important elements in a predication. Evidence for this view can be found in Clark and Clark (1977: see, e.g. , 53) : Listeners have at their command a battery of mental strate­ gies by which they segment sentences into constituents, classify them, and construct semantic representations from them. These strategies rely on the fact that sentences contain elements listeners can use as clues to proper segmen­ tation. One such strategy, according to Clark and Clark (1977: 61), goes as follows : STRATEGY 2 : After identifying the beginning of a consti­ tuent look for content words appropriate to that type of constituent. This might possibly be paraphrased as: whenever you identify a domain, look for the Head of that domain first, and then try to relate this Head to the Head of the superordinate domain (in Vfinal lgs.) or the Head of the subordinate domain (in V-initial lgs.). Evidence for such a highly speculative statement does not seem to be available. What appears to be rather transparent, however, is that PHP, if proven to be a valid ordering principle, will most probably be due to psycholinguistic strategies, especially in view of the nature of the evidence that has been offered in the pre­ vious sections. 4.. PHP AND ORDERING PRINCIPLES IN FG In the theory of Functional Grammar, Placement Rules are language specific in the sense that for any language there are rules that assign a position to every single element that a predication may contain. These rules are governed by general Principles of Constituent Ordering, which define the space within which Placement Rules can function, i.e. the extent to which certain ordering patterns are possible in natural language. The significance of an ordering principle may vary for each individual language. Furthermore, ordering principles are not necessarily harmonic, for the ordering that is preferred by principle A may be in conflict with the one that is preferred by principle B (see section 1). Other restrictors: adjectival phrase, possessive phrase, relative clause, etc. Arguments (if any), standard (in comparatives), degree adverbial. Table 5. The head noun is the first restrictor of a term. A language makes a basic choice between Prefield and Postfield ordering. The Subject position precedes the Object position. The Prefield is less hospitable to complex material than the Postfield; we may thus expect languages to take measures to relieve the Prefield of excessive complexity. Phrase - Adpositional Phrase - Subordinate clause. (XI) The preferred position of a Relator is at the periphery of its immediate relatum. (XII) The preferred relata. Relators — "elements that serve to link two constituents to each other" (Dik, in preparation) — do not figure in tables 2 and 5. This implies that they are the only elements that may occur between Heads. They include coordinators, subordinators, adpositions, and case markers (12). As for operators, they are grammatical or form elements that operate on lexical or content material such as verbs and nouns. A distinction is made between Term operators, Predi­ cate operators, and Predication operators. Term operators (see principle (VII)) typically encode such notions as (in)definiteness and number, which may be expressed formally by determiners and quantifiers/numerals. Grammatical expressions (auxiliary verbs and the like) indicating tense, mood, aspect, and polarity are referred to as Predicate operators (see principle (VI)). Notice that they do not include lexical expressions of temporality, aspectuality, etc. like last week or repeatedly. They do include two notions that are not necessarily required in the category Aux as defined in Steele et al. (1981): aspect and polarity. But as a rule they are part of the verb complex too (see e.g. Givon 1984: 64ff.). Predication operators are formal expres­ sions of illocutionary values such as declarative, imperative, and interrogative. We saw above that operators are not sensitive to Dik's basic Prefield/Postfield typology, for they are not included in table 3. Here a different position is taken, as can be observed in table 2, which divides overtly expressed linguistic material in any domain in essentially two categories : Heads and non-Heads or Attributive Material. The latter category includes Dik's Dependents as well as all operators. Consequently Term operators too must adhere to the Principle of Head Proximity and there are indeed languages in which all AM in the noun phrase appears either before (in V-final lgs.) or after the head noun (in V-initial lgs. ), as is the case in Japanese (Kuno 1978: 83) and Turkana (Dimmendaal 1982: 206) respectively. Stronger principles or "forces" will have to take care of the various ways in which languages may deviate from the ordering that is preferred in terms of PHP. In Nama Hottentot the declarative particle ke is usually present after the first constituent in every declarative sentence. The interrogative sentence does not have this particle, but can have the emphatic interrogative particle kxa in the same position. Imperative sentences also lack the declarative marker; instead the imperative particle re may appear sentence-finally (Hagman 1973: 259ff.). As a rule, however, such values are marked in the verb complex (cf. for examples Giv6n 1984: 70-71). In sum, it is suggested here that Term Operators are to be included in the material that is affected by FG Principle (I). But even then two ordering principles ((I) and (VI)) would be required to define structures for which one principle may suffice : the PRINCIPLE OF HEAD PROXIMITY, which was shown to be compa­ tible with the four best represented language classes I-V-XI-XII. 5. CONCLUSION In this paper we have attempted to demonstrate that univer­ sal tendencies of constituent ordering can be viewed as a conse­ quence of the PRINCIPLE OF HEAD PROXIMITY, which could also be related to the occurrence of Predicate operators in the second position of the clause in non-rigid V-final languages. It was shown too that there are various other linguistic patterns that make perfectly good sense in the light of head proximity. Hence they were interpreted as providing supporting evidence for the PHP. Although Attributive Material was restricted to only three categories (adjectives, genitives, and Predicate operators), PHP may be compatible with some 75 % of the languages. The fact that AM may appear between Heads must, in our opinion, be ascribed to other (notably stronger) ordering principles of the kind proposed in Dik 1983. Despite the fact that the bulk of this paper is of a highly speculative nature we would like to point out that PHP compares favourably with earlier proposals that tried to account for Greenberg's data (see note 2), because of its (potentially) greater descriptive and explanatory power. However, much more research is needed to substantiate the claims that are made here. Hemingway's The Sun Also Rises (some 1400 words). As it turned out only about 10 % of all subject NPs contained any AM, whereas this was the case for as much as 75 % of the other NPs. (6) Cf. Dixon (1980: 442) who states that Australian languages are often V-final and that in these languages "peripheral syntactic NPs [...] tend to occur close to the verb, either immediately before or _ most often — straight after it. Local NPs will usually follow the verb [...]. Within NPs it is most common for a possessive qualifier to precede and an adjec­ tive to follow the head noun." (7) Another common feature of the Kru languages is that finite lexical verbs appear in clause-second position too (cf. Marchese 1979), like in Dutch and German main clauses (i.e. : S Vf... O... V...). However, in the latter two languages the adjective precedes and the possessor phrase follows the head noun, which is the reason why they are not mentioned in the text. This ordering is extremely rare in languages with V-final patterns. (8) Greenberg (1966: 84) defined auxiliaries as "a closed class of verbs [...] inflected for both person and number [...] in construction with an open class of verbs not inflected for both person and number." (9) By definition the preferred position of the Relator, which does not figure in the Head/AM distinction, is between its two relata, e.g. N and V. (10) For the difference between Arguments and Satellites, see Dik (1978: chapter 3). (11) According to Reesink (14) consists of two clauses. In practice, however, (14) comes very close to a serial con­ struction as discussed in the next section. (12) Some specific Relators are discussed in Limburg (1983, 1985) and Kahrel (1985). REFERENCES BARTSCH, R., and T. VENNEMANN (1972). Semantic structures. Frankfurt am Main: Athenaum. BENNIS, H., and W.U.S. van LESSEN KLOEKE (eds.). 1983. Linguis­ tics in The Netherlands 1983. Dordrecht : For is. BOLKESTEIN, A.M., et al. (eds.). 1985. Predicates and terms in Functional Grammar. Functional Grammar Series 2. Dord­ recht : Foris. CLARK, H., and E.V. CLARK. 1977. Psychology and language. An introduction to psycholinguistics. New York: Harcourt Brace jovanovich, Inc. CORUM, C , et al. (eds.). 1973. You take the high node, and I'll take the low node — Papers from the ninth regional meeting of the Chicago Linguistic Society. Chicago : CLS. CRAIG, C.G. 1977. The structure of Jacaltec. Austin: University of Texas Press. CROWELL, T.H. 1979. A grammar of Bororo. PH. D. diss. Cornell University. Ann Arbor, Mich.: UMI. DAVIES, J., 1981. Kobon. Lingua Descriptive Studies 3. Amsterdam: North-Holland. DERBYSHIRE, D.C. 1979. Hixkaryana. Lingua Descriptive Studies 1. Amsterdam: North-Holland. DIK, S.C. 1978. Functional Grammar. Dordrecht : Foris. (ed.). 1983. Advances in Functional Grammar. Dordrecht : Foris. diachrony, typology, and formalisation in Functional Grammar. Unpubl. paper. Dept. of Language and Literature at Tilburg University — Language Dept., Free University Amsterdam (resp.). HAGMAN, R.S. 1973. Nama Hottentot grammar. PH.D. diss. Columbia University. Ann Arbor, Mich.: UMI. HAWKINS, 3. A. 1980. On implicational and distributional universals of word order. Journal of Linguistics 16, 193-235. 1983. Word order universals. New York: Academic Press. HEWITT, B.G. 1979. Abkhaz. Lingua Descriptive Studies 2. Amster­ dam: North-Holland. KAHREL, P. 1985. Indirect questions and relators. In Bolkestein et al. (eds. ), 165-181. KEENAN, E.L. 1978. On surface form and logical form. 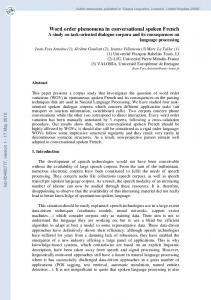 Studies in the linguistic sciences 8-2 (special issue), 163-204. 1985. Relative clauses. In Shopen (ed. ), Volume II, 141-170. KOOPMAN, H. 1984. The syntax of verbs: from verb movement rules in the Kru languages to Universal Grammar. PH.D. diss. Katholieke Hogeschool Tilburg. Dordrecht : Foris. KUNO, S. 1978. Japanese: a characteristic OV language. In Lehmann (ed. ), 57-138. LANGDON, M. 1977. Syntactic change and SOV structure: the Yuman case. In Li (ed. ), 255-290. LEHMANN, W.P. 1973. A structural principle of language and its implications. Language 49, 47-66. (ed.). 1978. Syntactic typology — Studies in the phenomeno­ logy of language. Sussex: the Harvester Press. LI, C.N. (ed.). 1977. Mechanisms of syntactic change. Austin: University of Texas Press. LIMBURG, M.J. 1983. The parameter preposition/posposition in word order typology. In Bennis and van Lessen Kloeke (eds. ), 149-159. 1985. On the notion 'Relator' and the expression of the genitive relation. In Bolkestein et al. (eds. ), 147-163. MARCHESE, L. 1979. Tense/aspect and the development of auxi­ liaries in the Kru language family. PH. D. diss. University of California, Los Angeles. Ann Arbor, Mich.: UMI. MARSACK, C.C. 1962. Teach yourself Samoan. London: The English Universities Press. MAXWELL, D.N. 1984. A typologically based principle of lineariza­ tion. Language 60, 251-285. MOORE, T.E. 1972. Speeded recognition of ungrammaticality. Journal of verbal learning and verbal behavior 11, 550-560. NOONAN, M.P. 1985. Complementation. In Shopen (ed. ), Volume II, 42-140. REESINK, G.P. 1984. Structures and their functions in Usan _ a Papuan language of Papua New Guinea. PH. D. diss. Universiteit van Amsterdam. ROSS, J.R. 1973. The Penthouse Principle and the order of consti­ tuents. In Corum et al. (eds. ), 397-422. SHOPEN, T. (ed.). 1985. Language typology and syntactic descrip­ tion. 3 volumes. Cambridge: Cambridge University Press. STAHLKE, S. 1970. Serial verbs. Studies in African linguistics 1-1, 60-90. STEELE, S. 1978. The category AUX as a language universal. In Greenberg 1978 (ed. ), 7-45. et al. 1981. An encyclopedia of Aux: a study in cross-lin­ guistic equivalence. Cambridge, Mass. : MIT. ZEPEDA, O. 1983. A Papago grammar. Tucson: University of Ari­ zona Press. ZWICKY, A.M. (1985). Heads. 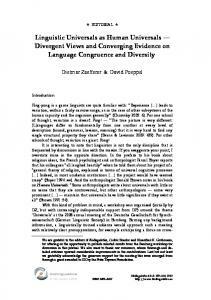 Journal of linguistics 21, 1-29. 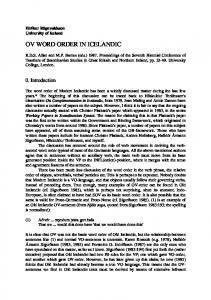 Report "WORD ORDER UNIVERSALS REVISITED"